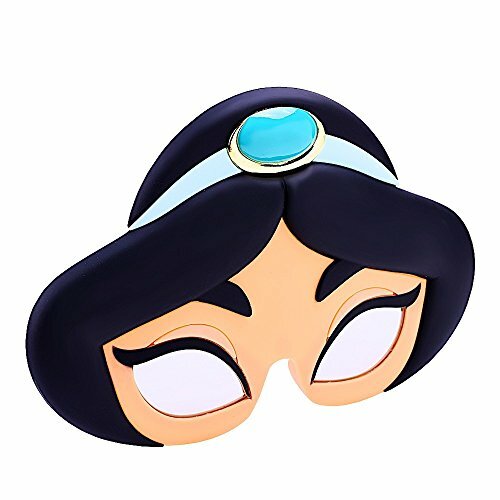 Feel like Princess Jasmine with these Aladdin Princess Jasmine Sun-Staches! 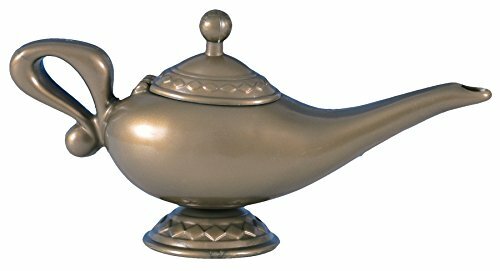 Don't forget the magic carpet! Sun-Staches provide 100% UV 400 protection and ultimate party fun. These one-size-fits-most sunglasses transform you into the star of the show; whether it’s a themed party, pop culture costume, or your favorite character. As seen on Shark Tank, these sunglasses are comfortable and perfect for adults and children of all ages! Sun-Staches can instantly transform anyone into the life of the party or the most interesting person at the supermarket. For the adults, it's the perfect way to bring out your inner kid-at-heart personality. For kids, it's a way to show off a favorite character or just have fun! Would you rather play a game of ultimate Frisbee with some boring guy without glasses or your neighbor who just happens to be wearing a leprechaun mask and having the time of their life? Our thoughts exactly. 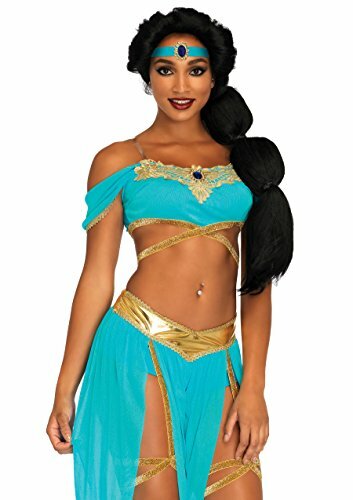 Aladdin Jasmine Princess cosplay costume Unique design! Enjoy wonderful life! Size measurement: S: Bust: 29.5-31.9" ---Shoulder: 15.7"---Length : 32.7" M : Bust: 31.9-34.6" ---Shoulder:16.1"---Length : 33.1" L: Bust: 34.6-37.4" ---Shoulder:16.5"---Length: 33.5" XL:Bust:37.4-40.6" ---Shoulder: 16.9"---Length: 33.9" There is 2-3% difference according to manual measurement. Please check the measurement chart carefully before you buy the item.1 inch = 2.54 cm Please note that slight color difference should be acceptable due to the light and screen.Any problems, please feel free to contact us directly anytime. It's our pleasure to make our entire customers satisfied and help you solve the problems. Thank you so much. 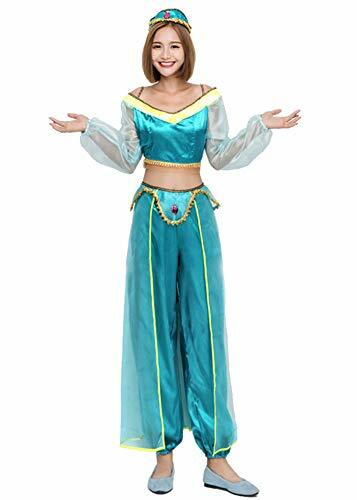 Package:1*top,1*pants Halloween, role play, all kinds of parties,special occasions and dress up,you can easy to handle after you get this dress. 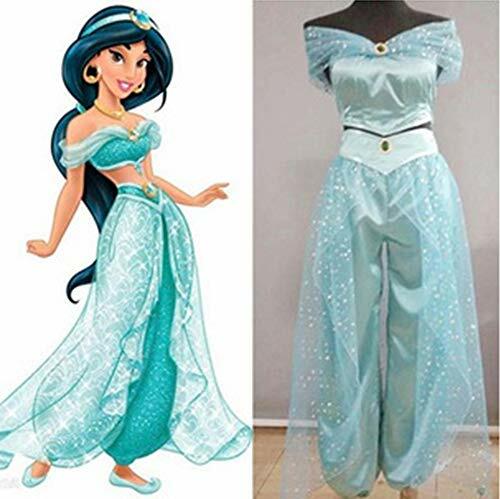 Let¡¯s have an wonderful adventure trip with princess Jasmine. About Size Details Size S,Bust 29.53''-31.89'',Waist 22.05''-24.02'',Hip 32.28''-34.65'' Size M,Bust 31.89''-34.65'',Waist 24.02''-25.98'',Hip 34.65''-36.41'' Size L,Bust 34.65''-37.40'',Waist 25.98''-29.53'',Hip 36.41''-38.98'' Size XL,Bust 37.40''-40.55'',Waist 29.53''-31.89'',Hip 38.58''-40.94'' Size 2XL,Bust 39.76''-42.91'',Waist 31.89''-35.43''.Hip 39.76''-42.91'' About Features: 1.Sequined mesh off shoulder, belly dance crop top is adorned with a rhinestone, stretchy back and padded. Pull on closure. 2.Elastic wide waistband pants with glittery mesh overlay, stretchy leg opening. 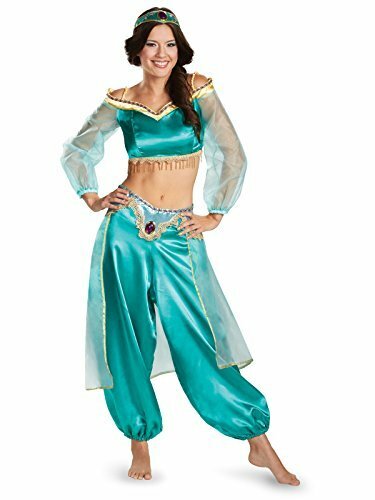 Beautiful costume set, soft and comfortable to wear. 3.Suitable for Halloween, cosplay, theme party, role play, special occasions, dress up, photography, holiday, etc. About Tips: 1.The suggested age and height is just for your reference. If your measurement is floating between two sizes, advise choosing the larger size. 2.Due to different screen,monitor,the color may different,pls in kind prevail. Get stunning mermaid hair without all the commitment! the ombre jewel long wavy wig by Leg Avenue gives you all the instar-worthy style without going to the saloon 4 different green and blue tones combine to make you look like the land mermaid you really are. Perfect for festivals, costume, and everyday looks, this beautiful wig was mer-made for you. 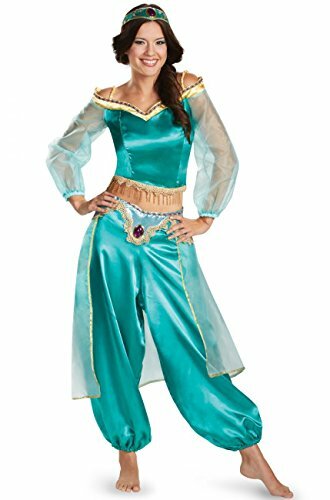 Stretch, sequined Arabian genie top with chiffon off the shoulder neckline and gold coin trim. 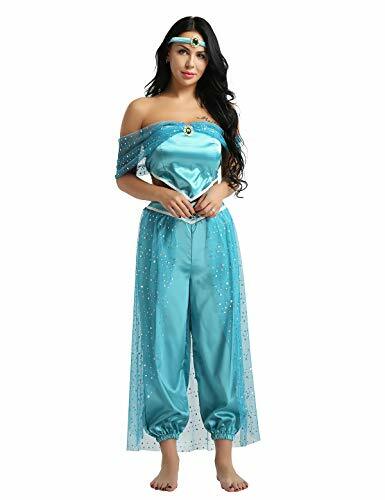 Chiffon genie pants have side slit, sequined waistband with gold coins and attached stretch short. Includes sequined, jeweled headband and gold neckpiece. 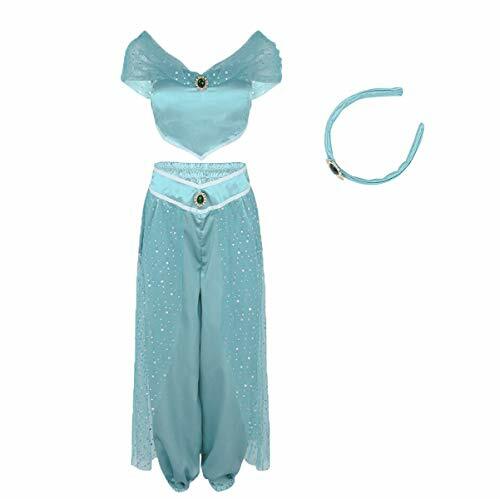 (Wig and additional jewelry not included.) 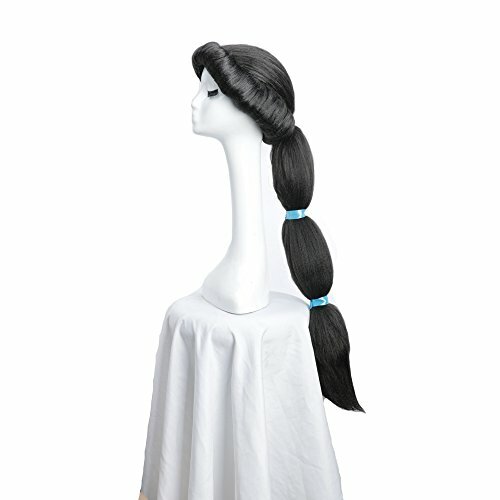 (four-piece set) complete the look with Dreamgirl harem princess wig. 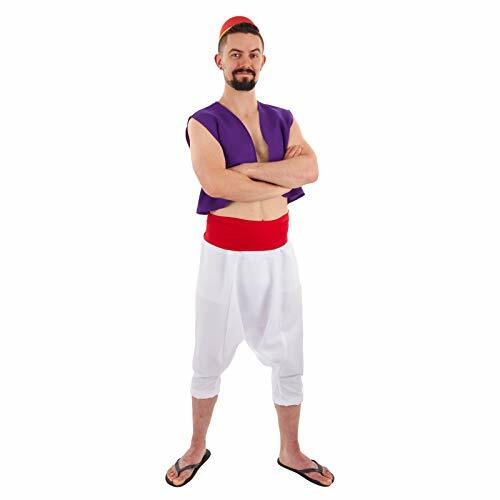 Rubie's brings fun and fantasy to dress-up with the broadest selection of costumes and accessories, offering everything from full mascot suits to masks and wigs, from deluxe licensed costumes to simple starter pieces, from costume shoes to character make-up, and so much more! Still family owned and still family focused after more than 60 years in business, Rubie's promotes safety in dress-up, so you can relax and have a great time while looking the part. Look to Rubie's for every costume occasion and season: Halloween, Christmas, Mardi Gras, Easter, and all in-between! All sizes are measured by hand,so there will be deviation. Please kindly understand, thank you!